I tasted 79 Rosés last week and have to say it was not a lot of fun. Mediocre wineries are trying to cash in on the boom in pink sales. However, there’s always a few stars and here is my list of recommendations. Enough to get you started, look for other posts later in June. All are regular LCBO offerings. 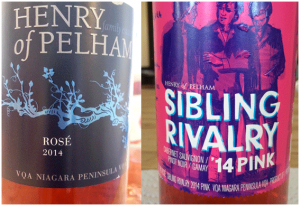 I like Henry of Pelham’s lean, tart, tangy dry Rosé with its gutsy, rustic feeling. Aperitif and appetizer wine. To get you going, and partner the shrimp. Or Sunday eggs. P.S. Those who prefer a trace of sweetness – hidden behind the tartness, should check-out Henry’s Sibling Rivalry. It’s quite fruity, fresh, and exuberant. Makes a good partner for spicy foods.